SMOK Philanthropic Education Aid 2018 Achieves Great Success - SMOK® Innovation keeps changing the vaping experience! On the occasion of China's 34th Teachers' Day, September 10, President Chen, Vice President Shen and other members of ShenZhen IVPS Technology CO., Ltd, went to ShuiDongJiang Middle School in Shaodong , Hunan Province, to attend a Philanthropic education aid event. The event turned out to be a great success that was warmly welcomed by local education committee, teachers and students. Shuidongjiang Middle School is located on beautiful Zhegu Mountain boasting a scenic landscape. Founded in 1804, the school has a long history and has produced a galaxy of talents. It covers an area of more than 20,000 square meters and has nearly 600 teachers and students. President Chen studied hard in school more than a decade ago and then walked far away from home for further study. Today, he has become an outstanding role model among all the alumni. On this sunny morning, the whole campus is full of joyous atmosphere. Dozens of student representatives stand on both sides of the school gate to greet their arrivals, while the rest of the students line up on the playground waiting for the activity initiation. The activity starts with the solemn flag-raising ceremony. All the teachers and students together with President Chen and his delegation stand up and salute with eyes. Next is the school leader's speech. The principal expresses his gratitude for the charity of IVPS and calls on all the students to learn from President Chen and Vice President Shen, that is, always have a grateful heart and never forget to return the love to the society. President Chen presented a bouquet to his teacher Nie Zihua to thank her tireless edification during his school time, which cultivated him a tough character and a grateful mind, befitting him for a lifetime. It was so warm and touching to see this reunion after more than ten years. Ms Nie couldn’t hide her excitement and her words were full of gratitude and blessings to her favorite one of pupils, at the same time, she also narrated the original intention of running this activity and her expectations for the local education. Later, President Chen gave a speech, he recalled his study experience here and thanked his teachers. For this event, IVPS will donate 566 sets of desks, tables and chairs, and will lead the establishment of the Financial Aid Fund, play a leading role in it and will actively call on the alumni to participate . 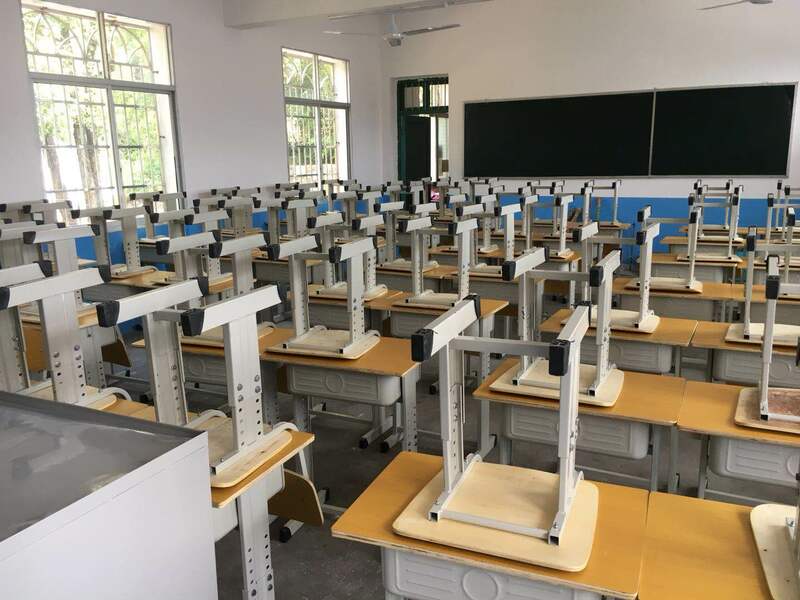 After speech, President Chen unveiled the new table and chairs with the school’s leaders, the new tables and chairs were particularly beautiful under the sun. Afterwards, President Chen signed a strategic cooperation agreement with the school. The school leaders award President Chen a plaque and unveil the “IVPS Financial Aid Fund” plaque with President Chen and President Shen. The fund's initial goal is to subsidize students whose family have financial problems and reward outstanding students and teachers, but in the future this fund will also help to repair auditorium, synthetic racetrack, road in front of school, and purchase teachers' computers, build libraries etc. This fund will gradually improve the school's software and hardware facilities, and meet the common demands of the school, teachers and students. As a leading company in the industry, IVPS actively fulfills its social responsibilities, enthusiastically promotes public welfare undertakings and gives back to the society with practical actions. Education is the first priority. Caring for the next generation is concerned about the future of the country. President Chen and President Shen are deeply influenced by this, it is education that has changed their destiny and made today's cause. Under the leadership of president Chen and President Shen, IVPS will always take youth education as company’s responsibility, as well as the main direction of charity. In the future IVPS will continue to increase public welfare investment, expand the scope of public welfare and set a benchmark for public welfare.